This is a Great Place to stay at!! The staff is incredibly friendly and even helps you organizing your trip. The bathrooms are as clean as they could be. There’s breakfast included, which usually isn’t the case. Also you’re close to the Malecon where you can watch the sunset and enjoy its great athmosphere. Best thing is the free WiFi in the morning as it’s usually complicated to get access to the internet in Cuba. All in all totally recommendable. I had the time of my life in Havanna and this was thanks to my stay at Casa de Ania and the lovely people I met there. I loved everything about my stay there: the staff (especially Ania who's a perfect hostess and the cleaning lady who was like a mum), the atmosphere (great place to meet other solo travelers), the food (breakfast burrito was heaven), the clean rooms (they'd even change the sheets every second day). 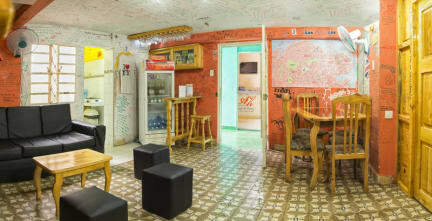 If I ever go back to Cuba, no question I'm going to stay at this hostel again!!! The best place to start your trip in Cuba! At Anias Hostal i felt like coming home when I returned after travelling two weeks in the country. The staff is super sweet (especially Amarilis and Lore!) And they will help you with whatever you need (organise trips, tell you where to find gifts etc, take care of your luggage etc.). And all for a very good price! The rooms have aircondition and lockers and you have an hour free Internet per day which is very convenient. I would recommend it anytime! Eins der besten Hostels in denen ich war! Super sauber, die Mitarbeiter sind extrem nett und es gibt sogar wifi im Hostel (für Kuba außergewöhnlich). Das Frühstück ist super lecker und ist im Vergleich günstig. Riesige Portionen. Es gibt nur 2 Dorms und deshalb ist die Atmosphäre sehr familiär. Gute Mischung an Reisenden. Ich war auf meiner Kuba Reise insgesamt 3x hier. Highly recommend :) Gracias Ania! Hallo Ihr Lieben ! :) Wir hatten einen tollen Aufenthalt im Hostel! Die Mitarbeiter sind sehr freundlich. Das Frühstück ist der Hammer und preis Leistungstechnisch das Beste war wir auf unserer Reise kennen gelernt haben :D In die Altstadt läuft man gut 20-25 min. Und die Bäder sind ziemlich klein. Wenn ihr nach Havanna weiter reisen wollt, lässt euch gerne vom Hostel eine Unterkunft reservieren: die sind fantastisch! Casa Pablo-Trinidad und Casa Gloria-Vinales! I wouldn‘t really recommend going there. It wasn’t that clean and aof friend of mine had bedbugs! If you want to pay in euro or US-Dollar they do a really bad exchange rate, the were even really unpleasant when you tried to pay with it.The breakfast is okay but you will get better once in Cuba. To meet people it’s nice, but that pretty much it.